In the last few years, weighted blankets have exploded in popularity. Every day, it seems there are more options coming onto the market. At first, it may seem like all weighted blankets are the same. However, having tried out many of the top brands, I believe there are four weighted blankets that really stand out among the rest. Which one of these four is right for you? YnM is all about options. It’s always nice to have choices when you’re shopping for bedding, but it is especially important in regard to weighted blankets. Namely, does the company have many different weights to choose from? While I tried the 25 lb YnM Weighted Blanket, they have many weights ranging from 12 to 25 lb. This makes it easy to find that perfect weight to fit your specific size. (They also offer a 5 lb blanket that could be a great fit for children.) Even hot sleepers could find what they need with their cooling model. Speaking of the 25 lb YnM, it is one of the more durable weighted blankets that I tried. With some weighted blankets, there is the possibility that the small glass beads or poly-pellets could spill out. However, my YnM Weighted Blanket featured quality stitching and multiple fabric layers to protect against spillage. 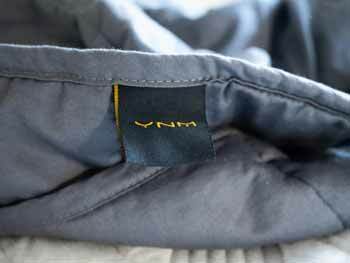 What Makes The YnM Weighted Blanket Stand Out? The company offers many options in terms of weight, size, and breathability. They even have models for children. YnM blankets are constructed to last. This means the fill should stay securely inside without spilling onto your bed or floor. The blankets feature tabs on the corners and sides. These make it easy to place the weighted blanket inside a duvet cover, giving it a different look and feel. Baloo only comes in two sizes: 15 lb and 20 lb. However, what the brand lacks in options, it makes up for in design, eco-friendliness, and philanthropy. First, this is one of the best weighted blankets I have tried in terms of weight distribution. Some weighted blankets feel heavier or lighter in some areas compared to others. In contrast, while lying under the Baloo, I feel the weight evenly spread across my body. This is probably because the Baloo has smaller, sewn-through boxes and channels to hold the fill. Baloo is also a great option for those who want a green, eco-friendly product. The company uses chemical-free materials in the construction of its weighted blankets, and its blankets are OEKO-TEX Standard 100 certified. What Makes The Baloo Weighted Blanket Stand Out? The blanket features a design that ensures the fill weight is evenly distributed throughout the blanket. You shouldn’t feel many flat spots in this blanket. The construction is very high-quality, so the blanket should last for a good amount of time, and the fill should stay within the blanket. The company has taken many steps to create an eco-friendly weighted blanket. 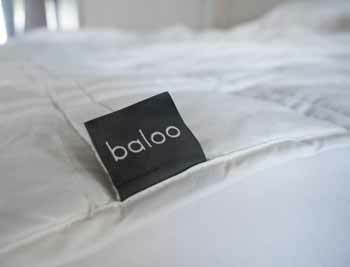 The materials are chemical-free, and Baloo invests back in the environment. In addition, for every customer review or piece of feedback, Baloo donates to the Pajama Program, which helps children in need. While weighted blankets can give you the feeling of a big hug and possibly help you sleep better, they are also quite warm. The extra-heavy fill and layers of fabric don’t always make for the most breathable piece of bedding. However, out of the weighted blankets I have tried, the CuteKing sleeps the coolest. While lying under the CuteKing, I feel more airflow than I do with other weighted blankets. Because of this, I don’t feel so sweaty or clammy. The CuteKing is actually designed to make sure you sleep cooler. The company uses less microfiber fabric and more fill in each square, making the blanket more breathable. It is still a warm piece of bedding, but it’s much less stifling than some other weighted blankets. What Makes The CuteKing Weighted Blanket Stand Out? It is one of the cooler sleeping weighted blankets on the market. The CuteKing is very breathable and promotes airflow through the blanket. The CuteKing has a high-quality construction, so it should be a longer-lasting blanket. The blanket comes with a 3-year warranty and 30-day money back guarantee, so you have a chance to try out whether the CuteKing is for you. No matter which weighted blanket you buy, you have the option of placing it in a duvet cover. This is a quick way to change the feel, look, and warmth of your weighted blanket. While this is usually an extra expense, the Quility weighted blanket comes with a free duvet cover. Considering the Queen-size blanket currently retails for $149, this is a very good value for a weighted blanket and cover. The cover is one of the softest, most comfortable covers I have tried. It is made of minky, a soft polyester material. Minky has the feeling of a child’s blanket or throw blanket. In addition, each side of the cover has a slightly different feel. One side is very soft, and the other has fuzzy, massaging bumps. Whichever side you choose, it should feel cozy and warm. 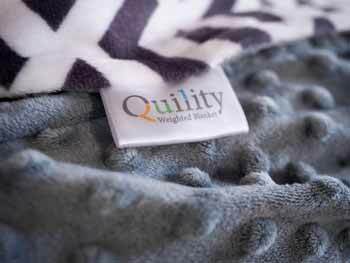 What Makes The Quility Weighted Blanket Stand Out? It comes with a free minky cover, making it a great value pick. The cover has two sides with two different soft feels. The minky cover makes this a warmer weighted blanket. It is a great choice for those who want a weighted blanket for colder nights. Even without the cover, the Quility is a well-made weighted blanket. The high-quality construction means it should be a durable, longer-lasting blanket. What Should You Think About When Buying A Weighted Blanket? Weight. If you are buying a weighted blanket you should, of course, find the right weight for you. Most weighted blanket producers recommend you choose a blanket that is 10 percent of your body weight, plus or minus one or two pounds. Some companies offer more options than others, making it easier to find that perfect weight. Weight distribution. Once you find the right weight, you also want to see how it is distributed throughout the blanket. Will you feel an even amount of weight across the whole blanket, or will certain areas feel heavier or lighter? For maximum effect, you want to find a blanket where the weight is dispersed evenly. Warmth and breathability. Because of their heavier fills and layers of fiber, weighted blankets are rarely the best at sleeping cool. That being said, some are more breathable than others. You definitely want to consider your sleeping environment and what time of year you will be using the blanket. Fill. Weighted blankets are, of course, loaded with a heavy amount of fill. What kind of fill is best for you? While some blankets use weighted discs, the majority of weighted blankets contain glass beads or poly-pellets. Glass beads are usually smaller, and they make it so the weighted blanket has a lower profile. Larger poly pellets can create a thicker, bumpier blanket. Durability. No matter what type of bedding you are looking for, it is always worth knowing how long it will last. Is it a good investment or will it fray quickly? This becomes doubly important when you are buying a weighted blanket. 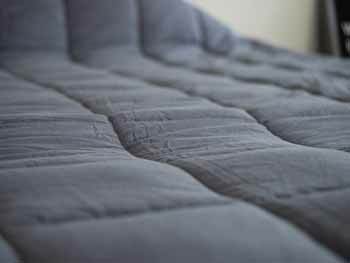 If you buy a weighted blanket with low-quality materials and poor construction, the fill could spill out of your blanket. If you don’t want to wake up with glass beads in your bed, choose a durable weighted blanket. If you think a weighted blanket is right for you, one of these four could be a great match. No matter what, if you consider the criteria above, you should be able to find a weighted blanket to fit your needs.